This Error Message Article explains the TEKLYNX CENTRAL error message “UMSS Error. Invalid user name or password” and details how to fix the underlying problem that caused it to appear. TEKLYNX CENTRAL is indicating that UMSS (component of TEKLYNX CENTRAL) does recognize the user login credentials as valid in the TEKLYNX CENTRAL system. When logging in to TEKLYNX CENTRAL directly (i.e. not using Windows Authentication), TEKLYNX CENTRAL will compare the credentials entered on this screen with the user setup in the UMSS database. If the credentials don’t match, the error message will appear. 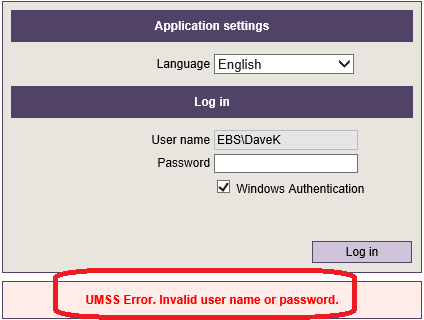 When logging into TEKLYNX CENTRAL via Windows Authentication, UMSS checks to see if the user ID exists in UMSS. UMSS assumes that, since the user likely authenticated into Windows prior to running TEKLYNX CENTRAL, there is no need to re-validate the user with another password request. Permissions in TEKLYNX CENTRAL are then determined by the user group(s) assigned to the user ID. Technically, this error message should not appear when using Windows Authentication. When logging into TEKLYNX CENTRAL via Windows Authentication with ‘Windows Authentication Password Prompt’ option selected, UMSS requests from Windows Active Directory a verification of the user ID and password. If Active Directory returns a confirmation that the user ID and password is valid AND the user has access to the server hosting TEKLYNX CENTRAL, it will allow access. However, if the user ID and password is invalid OR the user does not have access to the server hosting TEKLYNX CENTRAL, the “UMSS Error. Invalid user name or password” error message will appear and the user will not be able to continue. The requirement that the user have access to the server hosting TEKLYNX CENTRAL is being re-evaluated by TEKLYNX at the time this article was written. If using TEKLYNX CENTRAL direct / UMSS login authentication, check UMSS to make sure the user is entering the correct credentials. If the using Windows Authentication with the ‘Windows Authentication Password Prompt’ option selected in the BBUI Printing Interface Configuration, the user will be need to be given access to the server until TEKLYNX revises this feature.